About 50km outside of Ngaoundere lie the Tello Waterfalls. These are the most spectacular waterfalls that I’ve seen yet in Cameroon! After Peter finished up teaching the cyber café staff how to fix a decommissioned computer, we headed off to watch the Friday prayer at Mosque Alhadji Garou. I could be biased, but this is certainly the most beautiful mosque in Cameroon. Each Friday at 1:15PM, hundreds of Muslim men (mostly of Fulbe descent) come here to prayer. It’s quite a sight to see! A couple months ago, I spoke at a church to discuss a promotion for savings accounts for women at my host institution of MC2. As I briefly mentioned that I work with women’s groups, I was approached by Haowao, a teacher at the Amity International College (which is the equivalent of primary and secondary school in the U.S.). She worked herself up from nothing to something and now wants to help other women do the same. “I can teach,” she stated, “Can you introduce me to women’s groups?” Right up my alley. So, Haowao has started teaching how to design calabashes. The calabash is a fruit that is dried and cut to be traditional bowls. They are additionally carved and painted to be given as gifts for weddings and grand events and sell for approximately 5.000CFA ($10US). As the materials for a calabash are under 1.000CFA ($2US), it’s a great income-generating activity for women. Thus, Haowao currently teaches one of my women’s groups. They pay her 5.000CFA a month for eight hours of lessons (one two-hour class each week) and it takes between one to three months to learn. Everybody benefits! This is a world away from my previous life in the city! It turns out more than a few PCVs planned to go to Waza National Park for a safari. Since there were a total of fifteen of us, it ended up costing each person less than 10.000CFA ($20US) for the whole trip! Alim (+237 99 71 73 40) picked us up from our front door step as we hired a car from Maroua to Waza. I shared shotgun seat with Jasmine Junk and Jenny Wang while the rest of the car blasted 80s music from an IPOD. It was good times as when we got closer to the park, monkeys darted right in front of us. It was a hot day (I’m estimated 95+ degree Farenheit), but well worth it as we saw giraffes, vultures, warthogs (Puumba! ), ostriches, antelope, and deer. First safari in Africa: check! 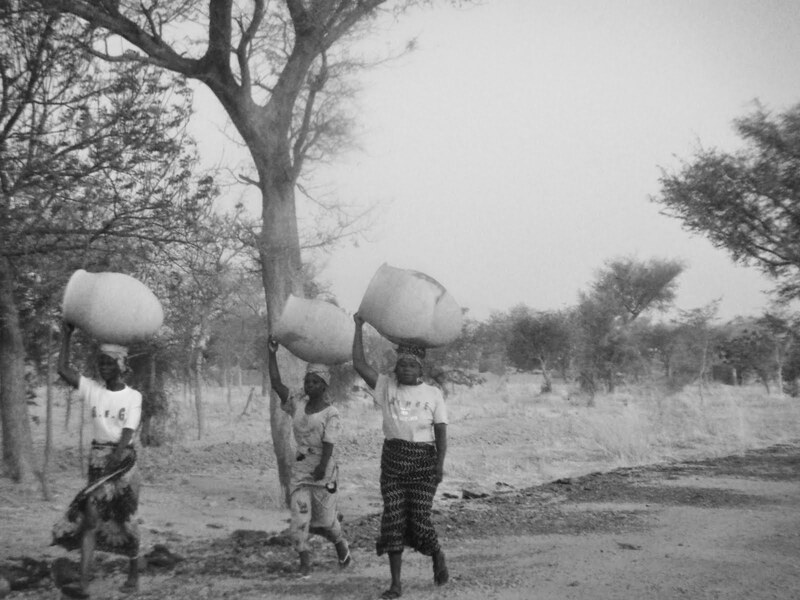 Maroua, the regional capital of the Extreme North region, is known for its handicrafts and cotton. Here, one can find the best artisan work in the country from paintings to jewelry. After a nine-hour bus ride from Ngaoundere to Cameroon, we were finally in Maroua. With two trip buddies on a paved road, this was one of the easier travels in Cameroon! If you're ever traveling in Cameroon and you're hungry, just grab something out the window! First stop: the Artisan Market (“Artisinat”)! In a period of an hour, I spent about 20.000CFA ($40US) buying gifts and crafts. Luckily, all the merchants there understand that PCVs like to bargain hard and as I spoke the little Fulfulde that I know, I was able to walk away with fair prices on everything from shell earrings (500CFA) to calabash shakers (1.000CFA). Andrea and I headed to the “Beauty Institute” at Domayo where our friends have a salon. In December, we met Joserne and Esther while taking the train from Ngaoundere to Yaounde and promised them that we would visit when we came to Maroua. It was really great to meet women who own their own successful business in a place where some women need permission to leave their homes. Go Joserne and Esther! First things first: Esther wants to do my hair! As she’s worked with foreigners in the past, I let her go while Andrea received a pedicure. The salon also offers massages and has a portable sauna. Never thought that I would be at a salon here in Africa! Joserne in the salon's portable sauna! Back at the PC house, PCV Martin Case requested a meeting with me. He had just changed sites and wanted to discuss project ideas and city living. It was highly productive as we discussed how to empower youth to how to figure out who has serious projects. The hightlight (beyond everything earlier that day!) was attending dinner with Joserne and Esther. We went to Restaurant Venice and enjoyed chicken and plantains over good laughter. Naturally, of course, Esther brought along her son in case Andrea was looking for a husband. My neighbor, Mariamou, is currently hosting a study abroad student from the Students of International Training (SIT) Program. Since Ashley is currently sick in the hospital with malaria, Andrea DeRocco and I came to pay her a visit yesterday. She must be hungry, I thought. I’ll bring her meat on a stick. Too bad she’s a vegetarian. Fail.